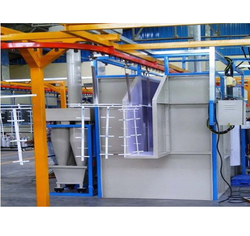 We Offer’s Conveyorised Powder Coating Booth, are specially suitable for powder coating of high volumes of components, large in size or small in size or any kind of product. This kind of Conveyorised Powder Coating booth is mainly helpful where synchronization of product input verses product output is to be maintained without any time lag. Our Conveyorised Powder Coating Plant are very elaborate in size which can accommodate two or more than two powder coater, automated painting guns or reciprocators etc. We offer’s Powder Coating Oven are economical and are recommended for low volume production. Normally job coaters opt for it as investment is low and the size of the product that is to be coated is uncertain. 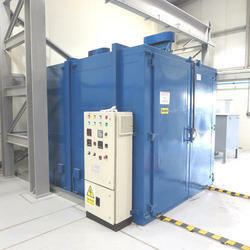 The plant includes a Spray Booth, Manual Guns and Handling System like Trolley or Manual Conveyor. 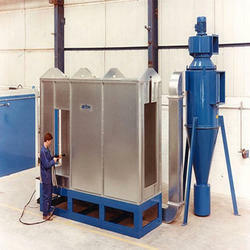 Powder Booth is provided with multi cyclone recovery system which is known as best recovery system all over the world. 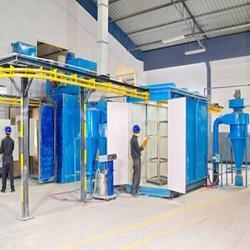 We Offer’s Batch Type Powder Coating Booth are perfect for small powder Coating applications. A cost-effective solution, this booth makes efficient use of shop space and is used for large or small parts. Ours powder Coating Booth With an open face design a different stage filtration system, the air is filtered in different stages and discharged back into the room. We Offer’s Cartridge Batch Powder Coating Booth feature an open front design and are ideal for small to mid-size powder applications. To ensure cartridge filters remain clean, this booth is built with a purge control feature, which assures the safe operation of the coatings enclosure by maintaining the airflow at design levels. 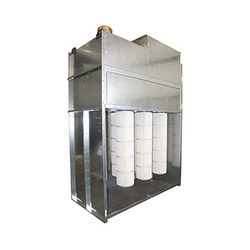 During operation, powder accumulates on the cartridge filters, and as the cartridge filters load, airflow decreases and negative pressure rises within the air handler. A timer activates a system of air purging valves that clear the cartridge filters of accumulated powder to ensure maximum filter life. A self-pulsing system continuously cleans cartridge filters for longer filter life. With the addition of a fluidized bed and pump, unused powder can be reclaimed for future powder application. Our industry is involved in offering a wide range of Powder Coating Plants all across the globe. These are fabricated with premium quality raw material sourced from a reliable vendor in the market. Our products are strong and sturdy and are highly durable in nature. The Powder Coating Screw Extruder Machines are extremely effective and give a great performance. We are offering our products at comprehensive rates.